This is the web page for Cortelyou Road Merchants Association, aka "CoRMA" a network of businesses on Cortelyou Road, Ditmas Park, Flatbush, Brooklyn. 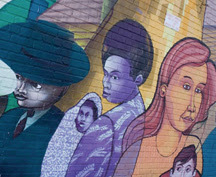 The New York Megaphone is a community activist newspaper in an active community named Ditmas Park/Flatbush, Brooklyn. We’ve got great diversity, growth, an active merchants association, and a solid community development organization in Flatbush Development Corporation. The neighborhood is affordable and safe, but it wasn’t always that way. Only ten years ago, banks used to “red line” this neighborhood. Even those with good credit couldn’t get a mortgage. A crack cocaine problem chased away Chase Bank. NYC has a bad reputation for gentrification, or instant growth that happens so fast, original residents and less-privileged folks get forced out. So, how can Ditmas Park grow, but grow for all? This is the question we want to ask, in a two-part series. First, we looked at the positives. We talked to local merchants about growth in the Cortelyou Road area. Next issue, our reporter Sophia Solovyova will tackle the question of who may be left behind. San Remo Pizza co-owner Matteo Amato reports that his business has been steady in the middle of all the changes on Cortelyou. “This is an established business owned by the Amato family since 1976. In the past few years we have changed the menu by adding many new items.” Soon, Amato plans to expand the pizzeria into a family-style restaurant. “This is not the old Giant Bagels shop!” says Giant Bagel manager Steven Silva. “The goal is to adapt to the requirements and changes of the neighborhood.” They will be renovating the front, installing WiFi, and changing the décor. Their most popular sandwiches are the Cuban and the grilled chicken and Silva reports that one customer, a 15-year resident of the neighborhood, said, “The old GB was so gloomy and unfriendly that I walked in and walked out.” Now, Silva says, the 15-year-old really enjoys socializing with the staff and loves the food. Belle & Maxie owner Gilbert Flores reports strong 400% growth in 2007. “We received many amazing reviews, notably in Urban Baby Daily, and expanded to include local artist Heather Louise Bennett, a doll-maker extraordinaire.” Flores, like many merchants, would like to see more specialty shops, services and restaurants open on Cortelyou Road. Flores’ goals for 2008 include the launch of an e-store at www.belleandmaxie.com. Did you know about The Healing Path Yoga Studio? Residents often ask for a yoga studio in Flatbush/Ditmas Park. Maybe they don’t know that Healing Path opened at 1410 Beverly Road in August 2007. Yoga instructor Einat seeks to familiarize people with her style of yoga, which emphasizes meditation, self-healing, and awareness. This is not the fitness yoga most people have become used to. It can be strenuous at times, but her yoga works on a different level - it is more like physical therapy than a workout. Brooklyn Hearth owner Jan Rosenberg finds Ditmas Park/Flatbush, “a vibrant and increasingly cohesive community.” Jan would know; as a real estate broker she has brought many new residents here. “There is a strong market for buyers and sellers, and excellent opportunities for renters. Ditmas Park has recently become better known and more visible as a real estate market. There are many new business and services that attract people into the neighborhood.” Jan’s husband reports it’s difficult to walk around with her; so many residents stop and thank her for finding them their homes. The Natural Frontier is the catch-all healthy food source for Cortelyou Road. Recently, the store has been seeing 10 percent growth, each month. “People are really into health. I was really surprised,” says manager Suraj Shrestha. The store opened reached profitability in its third month. Suraj says that the neighborhood can still use a bank but it is a good place to do business. Vipin Agarwal has a hospitality background from working in the hotel industry in Canada. He bought the Picket Fence restaurant from Graham and Chelsea Meyerson last year. He recently renovated it, adding more seating, fresh décor, bamboo hardwood tables, and improvements to the menu. Locals have been raving about the new food. A neighborhood anchor is in good hands! Few people have been in the neighborhood longer than Gabe Carino, owner of Gabe’s Camera City, which has been in business for 51 years. Carino is a survivor of two wars, two hold-ups and many competitors. “I’m up,” he says. “Three big camera stores closed up. They all moved.” In the past year, Carino has seen the growth of high rises, a new influx of people and rising demand for his electronic goods. “People want more!” he says. Carino is probably the most colorful neighborhood story-teller. When he talks about past hold-ups, he waves around a 9 mm Beretta, “now I’ve got a permit, and this is what I use.” Or, he recommends using his sister’s strategy. Years ago, while being held up at gunpoint, she refused to open the register, claiming she couldn’t do it, “unless she made a sale.” The thieves soon left, confused. Gabe is Chairman Emeritus, of the Cortelyou Road Merchants Association. “This is a neighborhood that is just about to pop. I love working in the neighborhood. It is my home,” reports the new manager at Connecticut Muffin, a newcomer to Cortelyou. CT Muffin reports they have gone through a period of adjustment. They started with a “high end menu,” which has since changed. “We also improved the decor, made seating more comfortable, and put a couch in the back.” One of Mark’s ideas is to bring students from the public school across the street to perform music once a week at CT muffin. How is Your Business Doing Compared to One Year Ago? Reported by Igor Kossov, Justin Stec, Sander Hicks, and Sophia Solovyova. Interviews were conducted and typed mostly by Sophia Solovyova. Written by Sander Hicks and Sophia Solovyova. I spoke with Jan & Gary today and we’ve all determined that it’s high time we have a CoRMA meeting for the New Year. There is a lot of important business to discuss. We are having the meeting on Friday Jan. 25th at 9:30 Sharp – 11:00 AM End (90 min.) at the Farm on Adderley (Corner of Cortelyou & Stratford Roads). We encourage all Cortelyou Road merchants whether members of CoRMA yet or not to attend. so please get the word out. Please RSVP. Block captains and others, please help me spread the word to those I haven’t reached by email. 1. Creating a CoRMA executive board - Jan Rosenberg and group discussion – 15 min. 2. The Zero Visibility Issue – TBD & Group discussion – 10 min..
4. New Members, CoRMA dues & Project Sweep – Gabe Carino – 10 min. 5. Welcome, new incoming director of FDC - Robin Redmond – 5 min. 6. Developments with the Cortelyou Road Streetscape – Mannix Gordon, FDC – 5 min. 7. Sponsorship & Advertisement in the “Guide to Victorian Flatbush 2008” – Mithout Gomez, FDC – 5 min. 9. CoRMA Graphic Design & Visibility, (T-Shirts, Stickers & logo) – Gilbert Flores – 5 min. 10. Holiday Lighting & Tot Lot Party Review– Mannix, Gabe, Sander, Sophia Francis – 5 min. 11. Block Captains Reporting – 5 min. 12. Other Business – 10 min. 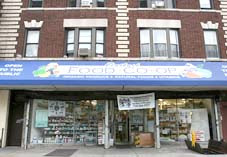 Flatbush Food Co-op will be opening up in the old Associated Grocery space around March 2008. Will be a great economic shot in the arm for our neighborhood. Here's a piece I helped get into Crain's New York Business about them, and Natural Frontier. For 30 years, the Flatbush Food Co-op pretty much had a corner on the market for healthful, organic food in its central Brooklyn neighborhood. No more. Natural Frontier, an organic grocer with three Manhattan stores, moved into a 2,200-square-foot space just three blocks down the street in June. Whole Foods and Trader Joe's will open outposts in Brooklyn next spring, and Fairway debuted there last year, bringing its specialty foods and organic offerings to the borough for the first time. In response, the Flatbush co-op, run by Barry Smith, is scrambling to expand its offerings and to add and improve services. Mr. Smith was a pioneer in the area when he opened the store in his basement in 1976, and he doesn't want to be muscled out. This past summer, the co-op took its biggest step ever: It signed a lease for a new site, just across Cortelyou Road, that had been occupied by an Associated Supermarket. The co-op will move into that location, which has three times as much space, by the end of the year. ``Space has been our biggest problem,'' says Mr. Smith. The co-op is so cramped that shopping is hard, and making money is even harder. Store margins have been pinched, since it costs more to stock goods in small quantities. And there's little room to display products prominently, much less to add a potentially lucrative deli section. ``prepared foods have been a growth sector for a number of years, and the Flatbush co-op hasn't been able to take advantage of those opportunities,'' Mr. Braverman says. That will change with the advent of the new store. Organic produce, the store's top category, will get plenty of prime space, and Mr. Smith intends to add more prepared foods and bulk items. The co-op has pulled off one surprising coup: recruiting an expert from a Trader Joe's on Long Island to be its produce manager. Plans are afoot to hire 10 more employees. Those moves come on the heels of earlier upgrades. The co-op has steadily expanded hours, which now run from 7 a.m. to 11 p.m., and it started a delivery service last year. In addition, Mr. Smith enjoys a couple of key advantages in competing with far larger rivals. he does much of his buying through the National Cooperative Grocers Association, which pools members' orders in order to get volume discounts and negotiate special promotions, and offers advice on new products and services. The general manager of the spiffy Natural Frontier down the street admits that the company has had to lower margins below the levels it enjoys in Manhattan in order to compete in its Brooklyn location. The Flatbush Food Co-op also boasts an asset that none of its rivals has: its status as a community-owned and -run retailer. It has 3,000 members, up tenfold from when the co-op moved to Cortelyou Road in 1985. Unlike some co-ops, the Flatbush store doesn't insist that shoppers become members, let alone require them to work at the co-op. Membership does have its advantages, however. Members qualify for full equity by making deposits totaling $200, which can be made in yearly installments of $25. In return, they get a discount on all purchases and a say in the running of the business. Decisions are made by a board elected by the members. The process can be cumbersome: The move to a new store was discussed and sites were evaluated for several years. Vox Pop’s newspaper, New York Megaphone, is doing a “Spotlight on Local Businesses” focusing on the Cortelyou Road area. We would appreciate you filling out a brief survey for us. We would like to quote you and use your name in our paper. This issue will be out in mid-December. 1. How long have you been in business here in the neighborhood? 2. How is your business doing compared to one year ago? 3. Is business on Cortelyou Road seasonal? What are the high and low points of the year? 4. In the last 5 years (if applicable), how has business been? 5. What do you contribute that growth/slow down to? 6. Do you feel that the neighborhood is changing? How has this affected your business? 7. What does the neighborhood still need? 8. Is your location on Cortelyou Road a good location for your business? 9. Is the local City government helpful to your business? Deadline: Tuesday, 11/27, 12 noon. the fabulous all-natural pet store, It's a Dog's World has only been around a couple months, but already, they are expanding the services they offer for your canine comrade: It's a Dog's World will now groom your best friend, be it dog, or kitty, starting Saturday, November 17th. Please call 718-684-5568 to make an appointment. Check out the outside.in Page Here. FLATBUSH FROLIC: "A Country Fair with a Cortelyou Flair"
FDC has made this year's Flatbush Frolic a more local affair, and we should all support them. Vendor Tables are still available! Mark your book: Sunday, September 16, 2007 – 11am to 6pm. LOCAL live bands, food, merchandise and arts and crafts. Check out the snazzy new webite. It's a Dog's World is located at 593 Coney Island Avenue, near Beverly. It's been opened since May 22nd. It's a Dog's World ONLY carries top quality dog and cat products. The foods contain no corn, by-products, unnamed protein or fat sources, or chemical preservatives. We also carry a line of raw food for dogs and cats, which is convenient, completely balanced and reasonably priced. The store is spacious, clean and light. It's easy to find what you want. It's a Dog's World's owner, Marion Weiner, is a neighborhood dog owner and a Certified Pet Dog Trainer with several years experience. She's an expert on dog behavior, has access to cat behavior experts, knows of most of the local vets and is a wealth of general dog and cat information. It's a Dog's World will be holding dog training classes and offers private behavior consultations, as well. Marion is owned by 2 rescue doggies. Her first dog and love, Lu, is a 10-year old Standard Poodle. He's been trained in competition obedience, agility and rally obedience. In his younger days, he was a keen hunter and sight hound. The will is still there, but the hips don't always cooperative. Marion has just got her 2nd pooch, Lennie, last week from the CACC in Brooklyn (where Marion volunteers). He's a year old Bijon with the sweetest disposition. Training is just beginning! Marion is also a cat lover, but her husband is allergic to them, which is why she sticks to hypoallergenic breeds. Marion cares passionately about switching today's training mentality from a coercive, "dominance" obsessed methodology, to training that uses proven scientific methods, based on Pavlovian and Skinnerian learning principles. She feels that these techniques not only are the most effective, but are also the most humane, since pain and submission are not part of the learning equation.